Yes, we know everyone wants a white or off-white kitchen these days. There are many beautiful white kitchens all over and they are stunning to say the least. However, this family from Shrewsbury, MA had a white kitchen in their mid-1990 home, but they wanted something different, something richer looking. We had the pleasure of designing a stunning new kitchen for them with a completely different color palette of cherry wood in a dark finish. The new kitchen includes a corner cooktop and a wall oven. The focal point when you walk into the space is the beautiful new wood range hood in the corner. To really enhance this area, Rooms With a View from Westboro, MA designed and installed a custom tile niche with a slightly rounded top. This makes for a great space to hold olive oil and spices when cooking. We also removed a closet pantry and installed a much more efficient tall pantry cabinet with slide-out shelves. 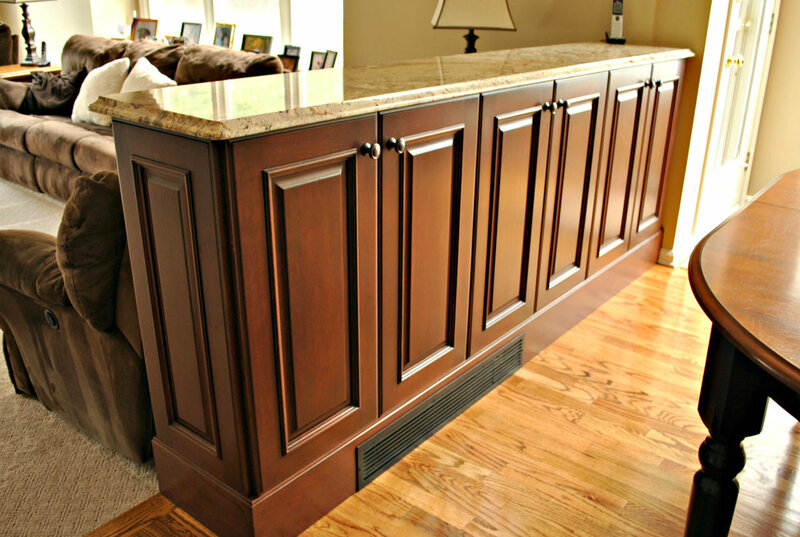 The homeowners love their new coffee bar located between the pantry and the refrigerator. Note the storage drawer with a Keurig K-Cup holder to keep them all organized. They now have a great spot to make a cup of tea or coffee on a cold winter morning and a convenient spot to pull something out of the refrigerator and heat it up in the microwave drawer below. As we move on to the sink area, the homeowners absolutely love the new bay window that overlooks their swimming pool and beautiful backyard. The counter extends into the window to make the area feel bigger. Next to the dishwasher is a pull-out that keeps rolls of aluminum foil and plastic wrap organized. Have you ever lost your keys or have been unsure what to do with the mail? Note the cabinet on the end of the run on the sink wall. Now the keys have a safe spot and the mail and even insect repellant can be hidden away. The island is a great place for the family to hang out while the meal is being prepared or for everyone to have a share in making a pie or batch of cookies together. Above the wall oven is a convenient spot to store trays and baking sheets. Next to the wall oven is a special cabinet for spices and oil, a great feature for the serious cook. Previously in the kitchen was a half-wall that separated it from the family room. It held a few photos, but seemed to turn into a catch-all. 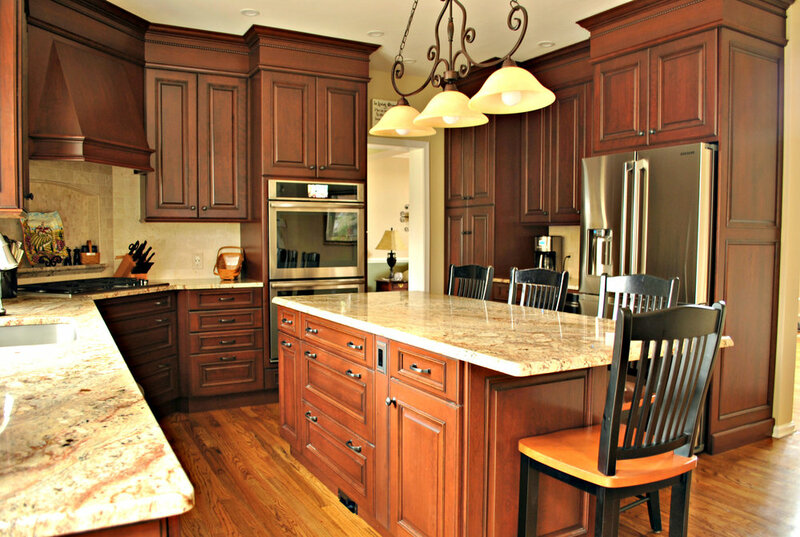 We removed the half-wall and replaced it with shallow cabinets that maximized storage space and yet maintained the elegance that the home deserved. Yes, white can be right for some, but in this case a dark cherry was the way to go!